Your property depends on you to manage emergencies, keep the property safe and practice effective human resources skills with security employees. You succeed because of your sound judgment and practical skills. 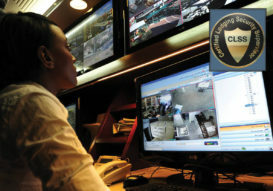 Earn the Certified Lodging Security Supervisor certification to increase your professionalism and show that you are an outstanding lodging security supervisor. You qualify for the CLSS if you are currently employed in a position where you supervise two or more people, have responsibilities for security issues at property-level, has job duties that are at least 20 percent supervisory in nature and include such tasks as scheduling, training, interviewing, disciplining, inspecting, and conducting performance reviews; makes decisions and judgment calls while performing daily duties; and have input on hiring and firing decisions within a department. Download the Certified Lodging Security Supervisor (CLSS®) application. Candidates will receive CLSS study materials. A proctor may be a CHA, CLSS, a hospitality educator, an AHLA member association executive, your immediate supervisor or a member of the clergy. Your designated proctor cannot be a relative.